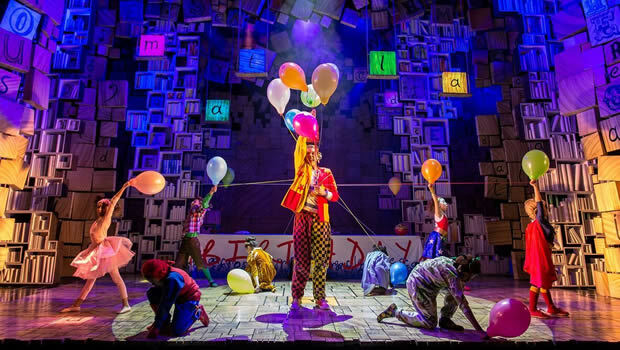 "tender, clever but heartfelt too"
As Matilda the Musical approaches its seventh year in the West End, and a new adult cast has had a couple of weeks to bed in, what better time to revisit this most delightful of shows. Dennis Kelly's adaptation of Road Dahl's novel remains the perfect interpretation of the slightly surreal nature of his writing but it is Tim Minchin's glorious music and lyrics that elevates the show into a real classic; grotesque but tender, clever but heartfelt too. And it is a testament to Matilda's enduring quality that it is still attracting an excellent calibre of performer to join its cast. Famed for playing roles such as Glinda in Wicked and Christine in The Phantom of the Opera, Gina Beck is pretty much perfectly cast as Miss Honey here, the radiant warmth of her gorgeous voice an ideal match to this most kind of characters and though it may take her some time, when she needs to show her inner strength you thoroughly believe her. David Shannon's credits are no less impressive - a former Phantom and Jean Valjean no less - and he steps into the hammer-throwing Miss Trunchbull's sensible brogues with real gusto. As with Marianne Benedict and Tom Edden who play Matilda's parents, we have to believe how thoroughly rotten these people are, how despicably they will behave, and all three are utterly convincing, and entertaining, as they push at just how dark they can go. But it's not all doom and gloom, far from it, for there's a classroom full of 'revolting children' to save the day. And again, you're left in awe at the skill of the casting directors Will Burton and Jessica Ronane, and particularly Ronane, as she has to find four teams of younger performers to rotate across the evening. Abbie Vena made for an outrageously talented Matilda, not putting a foot wrong as she navigates the substantial trials of life, and building a beautiful chemistry with Keisha Amponsa Banson's lovely librarian Mrs Phelps. Along with Rob Howell's brightly ingenious design, Peter Darling's vibrant choreography, and Laurie Perkins' irresistibly perky musical direction, Matilda remains as gloriously cheering as it did when it first arrived in London. And on this form, you can imagine running for another seven years, at least!